Currie Park	Currie Park is an important neighborhood destination as it's the only park adjacent to Cedar Avenue. Master Plan: After two years of extensive community engagement, the Currie Park Master Plan was approved in 2016 as part of the South Service Area Master Plan. The Currie Park Master Plan will guide outdoor park improvements at Currie Park for the next 20-30 years. Click the link below to view the master plan. Name: The park was named for Edward A. Currie in 1977. Currie was the director of the Pillsbury Settlement House that had existed next to the new park land for many years. For decades before that the park was referred to as Sixth Ward Playground, although in later years it was at times called Cedar Square West Neighborhood Park. 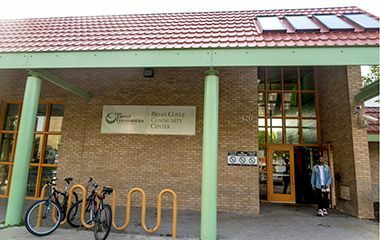 The park board also holds title to the land adjacent to the park on which Pillsbury United Communities built Brian Coyle Community Center in 1993. The center was named for a city council member from the neighborhood who had served on the council from 1983 to 1991. The idea of a playground in the Cedar-Riverside neighborhood is far older than the playground itself. In 1919 the park board considered purchasing two lots for playgrounds in the area, but the neighborhood was evenly divided for and against acquiring the land and charging the cost to area property owners through assessments. Park superintendent Theodore Wirth noted in the 1919 annual report that one reason for reluctance to establish playgrounds in the area was the projection that the area would decline in population and become more of a commercial and industrial neighborhood. The lack of agreement within the neighborhood on the location and method of paying for a park ended consideration of a playground for many years. One of the next mentions of a playground for the Sixth Ward in park board proceedings came in May 1932 when Wirth recommended that the park board “renew” its lease, for $100 a year, on a portion of the land where Currie Park is now located, with an option to renew the lease for four years. Park board records do not indicate if that lease was ever renewed—or when it originated. More requests for a playground at the site were received in 1937 and in 1939 the park board once again approved leasing the land, this time for only $1 a year. At that time the park board reported that the land had previously been leased to the Pillsbury Settlement House. The challenge to the park board in adding another playground after years of depression and pinched pennies was not the cost of leasing the land but maintaining it and providing supervision. This was at a time when the only improvements in the park system were made with the help of federal work relief programs and even recreation supervisors were paid by federal programs. The success of the new playground led the park board to purchase the 1.2-acre lot in 1941 in large measure thanks to a gift of $1,000 from Mary E. Howe. The site was acquired for a little more than half of her donation—$525. As cheap as it was, it was one of the few land purchases by the park board in the 1930s. Other than some additional grading and fencing for the park in 1946, the park board spent no additional money on improving the park. The construction of freeways beside the park in the 1960s did not require land to be taken from the park, but those freeways effectively severed the park from neighborhoods to the west. Another major development in the 1960s, the expansion of the University of Minnesota on the west bank of the Mississippi River, served to further reduce the population of the neighborhood. The next major development at the little park awaited the explosion of population in the area with the construction of Cedar Square, a high-rise apartment complex across the street from the park in the 1970s. In 1975, the Minneapolis housing authority sought the park board’s help in expanding and improving what was then referred to as Cedar Square West Neighborhood Park and offered to use redevelopment funds to expand the park, which would be repaid when the park board had funds available. The housing authority gave the park board an additional 1.5 acres of land to expand the park in 1976 and together with the park board developed the park in 1979 under a joint powers agreement. 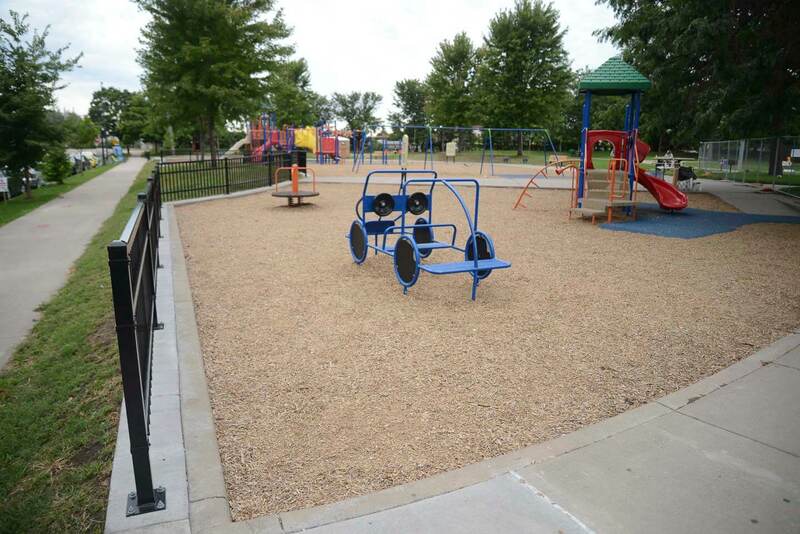 Under that agreement a shelter was built in the park and playground and athletic facilities were improved. 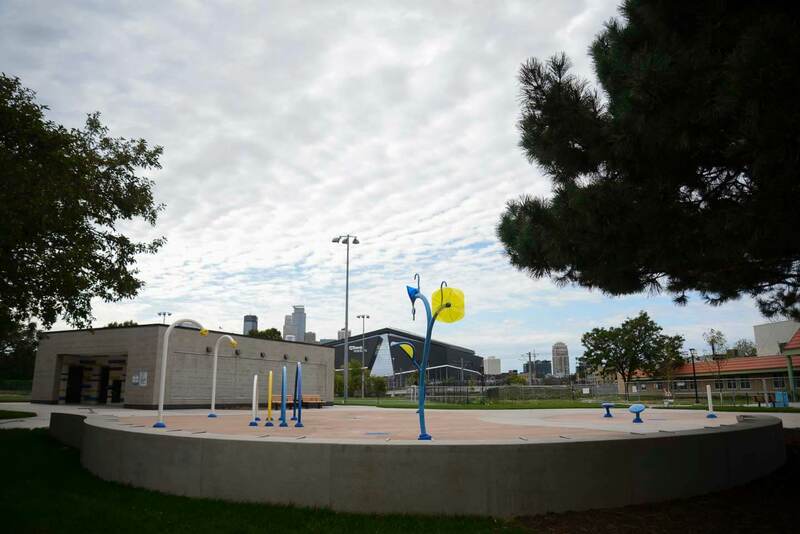 In 1992 the park expanded again when Pillsbury United Communities, the social service agency that grew out of the Pillsbury Settlement House that had once existed next to the park land, built a community center adjacent to the park. The agency deeded the building and the land it occupied to the park board, but retained operating control of the facility. It named the center for Brian Coyle who had been a city council member from 1983 until his death in 1991. The playground at the park was updated, along with other improvements, in 2003-2004. In 2011, artificial turf was installed on the soccer fields, making them playable and maintainable for much more of the year. Also that year a Nice Ride bicycle rental kiosk was installed. In 2013 a new maple gym floor was installed in the community center, which is still operated by Pillsbury United Communities under a lease agreement with the park board. 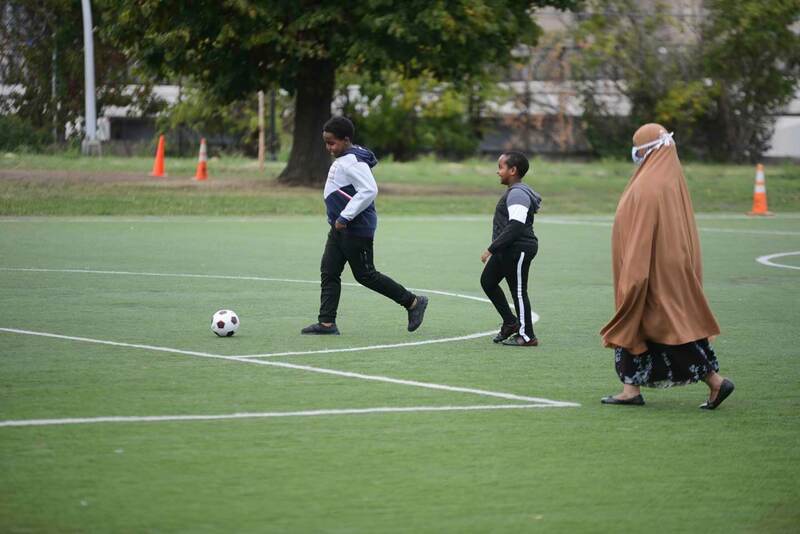 Coyle Community Center offers programming year-round through Pillsbury United Communities. Call 612-499-9309 or send an email to reserve a Currie Park field. Practice your shot or your one-on-one on these half-courts. If you're looking for a full-court game just head to East Phillips Park.